My loose spin on P.F. 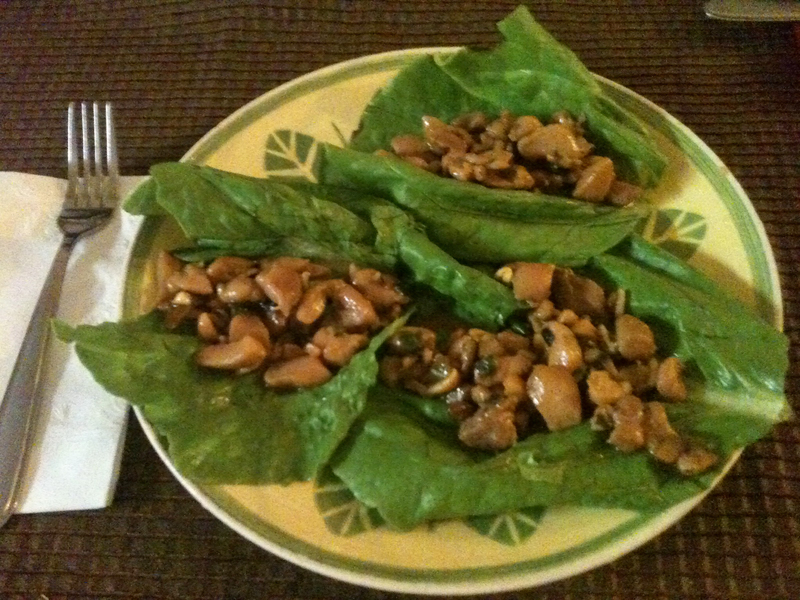 Chang’s classic “Chicken Lettuce Wraps”. P.F. Chang’s serves it as an appetizer, but this recipe makes enough for a meal. 2 pounds Boneless Skinless Chicken Thighs or Pork Loin diced as small as feasible - 1/4” dice - (or coarsely ground… much easier). 2 Teaspoons of Arrowroot Starch dissolved in an equal amount of water (give it a good stir just before adding to the meat). 7 Green Onions (Scallions) Chop the green parts into 1 in. pieces and the white parts very thinly. Thinly sliced Shallots also work well. Coconut Oil or Peanut oil for stir frying. To the diced chicken or pork add the arrowroot mixture, 2 Tbsp. Wheat-free Tamari and the green onion and mix. Allow to stand at room temp. long enough to take the chill off - about a half hour - the stir frying goes quicker if the meat is not ice cold. Combine the sauce ingredients in a mixing bowl and mix well. Set aside. Stir fry the meat in small batches in a medium hot wok in a few tablespoons of Coconut or Peanut oil. Remove each batch to a covered bowl with a slotted spoon leaving as much oil in the wok as possible. As the last batch of meat finishes cooking, add the Mushrooms, Cashews or Water Chestnuts and half of the “Special” sauce. Cook for two to five minutes until the mushrooms are done to your liking. At this point add the rest of the cooked meat back to the wok. Cook for another 5 minutes or so until the sauces reduces and thickens. Serve in a large bowl and allow guests to fill their own lettuce cup and wrap as they wish. Serve with brown rice (for those at your table not doing the Low-Carb thing) and the remaining “Special Sauce” on the side for topping the lettuce or the rice.